Liczba stron: 132 Jest to ujednolicona liczba stron, która ułatwi Ci porównanie długości książek. Każda strona Legimi to 200 słów. 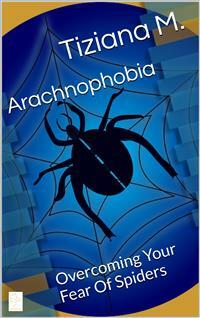 Opis ebooka Arachnophobia - Tiziana M.
Phobia comes from the Greek word for “fear”. It is astrong, persistent fear of situations, objects, activities, orpersons. The main symptom of this disorder is theexcessive, unreasonable desire to avoid the feared subject.When the fear is beyond one’s control or if the fear isinterfering with daily life then a diagnosis under one of theanxiety disorders can be made.Phobias are among several anxiety disorders, whichalso include panic disorder, post-traumatic stress disorder,and obsessive-compulsive disorder and generalized anxietydisorder. Such unrealistic or excessive fear of objects orsituations is a psychological disorder that can makes lifemiserable for years. Opinie o ebooku Arachnophobia - Tiziana M.
Fragment ebooka Arachnophobia - Tiziana M.
Carey Show”), and Jeff Daniels (“Dumb and Dumber”). But it doesn’t take a movie to frighten people who suffer from arachnophobia. Spiders can be anywhere and everywhere. That fact alone strikes terror into the hearts of those who hold this phobia in their minds. me a snake and it’s a different story. So I understand! God did not make spiders cute and cuddly. He did not make them fun or even interesting – well, to most people. spaces occasionally spinning a web for you to get all over your face if you walk through it. Around Halloween, this can be great – handmade decorations! But at other times, it’s just a nuisance. you have to consider the deadly Tarantulas, and other poisonous spiders that can be lurking just underneath your house. do like I do and just grab a shoe sending that spider into the great unknown. But they’re not able to do that: at least not yet. There are ways to overcome the fear of spiders. Let’s take a good look at why people are afraid of spiders, how phobias develop, and ways to overcome that fear and lead a satisfying life right alongside those 8 legged creatures. Phobia comes from the Greek word for “fear”. It is a strong, persistent fear of situations, objects, activities, or persons. The main symptom of this disorder is the excessive, unreasonable desire to avoid the feared subject. When the fear is beyond one’s control or if the fear is interfering with daily life then a diagnosis under one of the anxiety disorders can be made. So, in essence, phobias are a type of anxiety disorder much along the lines of panic and fear. An American study by the National Institute of Mental Health (NIMH) found that between 8.7% and 18.1% of Americans suffer from phobias. Broken down by age and gender, the study found that phobias were the most common mental illness among women in all age groups and the second most common illness among men older than 25.
phobias. They are the most common psychiatric illness among women of all ages and are the second most common illness among men older than 25.
afraid. While fear is a consequence of a phobia, it is not the definition of it. It is simply a symptom. Phobia is also used in a non-medical sense for aversions of all sorts. These terms are usually constructed with suffix –phobia. A number of these terms describe negative attitudes or prejudices toward the named subject. Some examples include homophobia (fear or dislike of homosexuals), xenophobia (fear or dislike of strangers), and even Christianophobia (fear or dislike of Christians). type of word game, however, few of these terms are found in medical literature. (irrational fear may grow into a phobia when it starts interfering with the person's usual activities). The most common simple (specific) phobias are those of the insects (arachnophobia in your case), mice, reptiles and other animals. These phobias usually begin in childhood and often disappear without treatment. some people do) would technically be classified as a true phobia since cotton balls cannot cause harm. However, fearing lions or a hurricane does not classically qualify as a phobia because encounters with either do carry a possibility of harm or death. So what about the fear of spiders? “Gilligan’s Island” that was the size of a hippopotamus. At any rate, even though some spiders are poisonous,we still should not have fear of them. We can exterminate them and be on with our lives. For the arachnophobe, yes, that is easier said than done, but it is truth. So, yes, fear of spiders does really qualify as a phobia. When encountered with the phobic stimuli, people are overcome with a strong and immediate anxiety reaction (sweating, palpitations, paleness, breathing difficulty). Gradually, mere anticipation or imagery of the phobic stimulus comes to provoke anxiety symptoms and can lead to avoidance behavior and/or significant modification of one's lifestyle. It is at this point when the phobia becomes problematic and treatment should be explored. It can be confusing to try and figure out why some people fear certain things. The answer isn’t as easy as you might think. Fear is an emotion which develops out of uncertainty. And uncertainty itself is, basically, the perceived inability to control. Put this way it appears very simple — fear is not real, fear is just a perception. If only we could convince ourselves of that! Much is still unknown about what causes phobias. However, there may be a strong correlation between your phobias and the phobias of your parents. Children may learn phobias by observing a family member's phobic reaction to an object or a situation. An example of a common learned phobia may be the fear of snakes. what will happen to us and how it will ultimately affect us. Or in some instances, we jump ahead of ourselves and imagine what the outcome of a situation will be, which is usually ten times worse than the actual reality of the situation. childhood and persists through to adult remaining with the person almost as if it’s a part of them. quickly grows into a major problem. aren’t in the forefront initially, but become exposed later. As an example, let’s say in 7th grade, a boy is the popular kid in school. All the girls swoon over him, all the guys are his friends. He is teacher’s pet and a favorite with his friend’s parents. an effort to protect his feelings and fend off the rejection he thinks might be coming. doesn't always help because the phobia may bear little relation to it. Some people believe that phobias develop from the body’s natural desire to protect itself. Unconscious or emotional learning takes place to keep us safe. In primitive conditions when coming into contact with something dangerous, the mind/body would create the optimum state for survival - a panic attack. This type of learning is not of the intellectual or rational type. If you had to think, “Yes, I think this would be a good time to have a panic attack" our species would have died out long ago. This type of learning takes place at an emotional level so that the response can bypass the ‘thinking brain' In the past, an immediate phobic response to a predatory or poisonous animal would have been exceedingly useful. We therefore evolved with the ability to become phobic. In today’s complex world however, this learning mechanism often works in an inappropriate way. Non-specific phobias can come about either through a 'spreading-out' of panic attacks, or through a person's levels of general anxiety becoming so high that panic is easily triggered whenever stress levels are raised even slightly. silly – our cats are really cute – we still accommodate her when she visits by putting the cats away. Phobias have actually been around for years. Here are some interesting facts about phobias and people who suffered from them. believed to have a religious association). The second half of the nineteenth century, however, saw a massive change in this sphere. Roundabout this time psychiatry began to flourish as a fully developed medical discipline. These psychiatry professionals uncovered the real causes behind these spectacular mental disorders, putting aside all misconceptions and delusions associated with phobias. The year 1966 happens to be an important year in the history of phobias. It was in this year that the first phobia organization in the world, ‘The Open Door’, was founded. Now the organization has been re-named PAX – a Latin word, which means peace. PAX stands for panic attacks & anxiety disorders and ensures the peace of mind for all. The Greek physician Hippocrates was alive over 300 years before the birth of Jesus and described a man who, '...through bashfulness, suspicion and timorousness, will not be seen abroad...he thinks every man observes him.' This description of social phobia is nearly two and a half centuries old! King James I...Fear of Unsheathed Swords. King Henry III of France...Fear of Cats. Sigmund Freud…..Anxiety Symptoms, Fear of Travel. The phobic could also become dizzy, disoriented, be overcome with excessive sweat, and feel heart palpitations. They can become nauseous, feel out of control or that they may die, and be able to speak or think clearly. These are also symptoms of panic attacks, and they can be very, very scary.